Static helmet design with no adjustable fit features other than the chin strap. 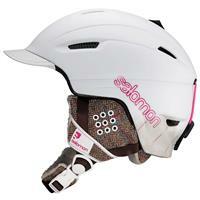 Beanie compatible freestyle helmet for women with active ventilation and removable earpads for year round riding. Poison is a true year-round freeride helmet, with active ventilation, removable ear pads, and Salomon's original removable visor for use in all weather conditions.